Looking for a convention destination that&apos;s a little bit different? We&apos;ve been hosting visitors in Mobile for over 300 years and our genuine southern hospitality, flair for throwing one heck of an event (America&apos;s original Mardi Gras, anyone?) and commitment to making Mobile a city to remember, all work together to help you plan a convention your clients will talk about for years. 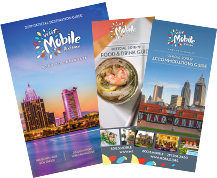 Once you discover historic Mobile, you&apos;ll find fantastic accommodations, activities and venues with a southern accent on value, service, hospitality and fun. The waterfront Arthur R. Outlaw Convention Center, within walking distance to over 1,000 hotel rooms, restaurants, attractions and shopping, is one of the premiere meeting and exhibition venues of its kind in the South. It offers incredible flexibility for business, sporting and social functions. Over 6,000 hotel rooms can be found throughout the city should your group be looking for a wide range of other venues, rates and locales. Your convention success is assured with the assistance of Visit Mobile and the Convention Center&apos;s staff, a committed team of experienced professionals who love this city. Mobile is easily accessible from three major airports and Interstates 10 and 65. Time away from your meetings and business functions will be the best time of all. Literally outside your door you&apos;ll find dozens of locally owned restaurants, cafes, art galleries, parks, theaters, shopping and attractions. When you arrive in Mobile, you&apos;ll soon learn that we are the most unique city on the Gulf Coast and one we service with pride.